The Spinosaurus is based on a real dinosaur that paleontologists have recently discovered. This basis in reality can be both good and bad for the design crew. The good side is that they have a solid foundation to start with. The bad side is that it provides a very specific set of criteria that must be matched. 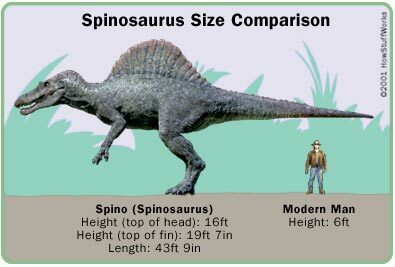 The Spinosaurus is the largest meat-eating dinosaur ever discovered. Build a maquette (miniature model). Create a mold (from the sculpture) and cast the body. Test it and work out any bugs. A complicated animatronic figure could take up to two years from conception to completion. However, deadlines and budgets typically don't allow for a timeline like that. According to John Rosengrant, SWS effects supervisor for "Jurassic Park III," the Spinosaurus took less than a year to go from the drawing board to the finished product. Rosengrant supervised a crew of about 75 SWS designers, engineers and artists who worked on "Jurassic Park III" animatronics, and approximately 30 of them worked on developing the Spinosaurus. On the next page, we will go through the first two steps of this process.